The IRR or internal rate of return is a means of evaluating a project by finding the discount rate at which the net present value of the cash flows is equal to zero. At the IRR, the cash flow returned by the project is equal to the cash flow invested in the project. This free IRR calculator allows for up to five projects and ten years of future cash flows following the initial investment amount. The IRR calculator is used by entering cash outflows as a negative number and cash inflows as a positive number. Year 0 is the start of the project and usually represents the initial investment and is normally a negative cash flow. The following years represent cash flows at the end of that year. Normally a business would seek a minimum IRR equal to the cost of borrowing money or the required rate of return. For example, if a project has an investment in year 0 of 20,000 and a cash inflow in year 1 of 21,000, then the IRR calculator shows the IRR is 5%, and the net present value of the cash flows at 5% would be zero. If however, the business has a cost of borrowing or a required return higher than the IRR of say 8%, then the net present value of the cash flows would be negative (-556) and the project is probably not worthwhile. Likewise, if the business has a cost of borrowing or required rate of return lower than the IRR say 2%, then the net present value of the cash flows would be positive (588) and the project probably is worthwhile. 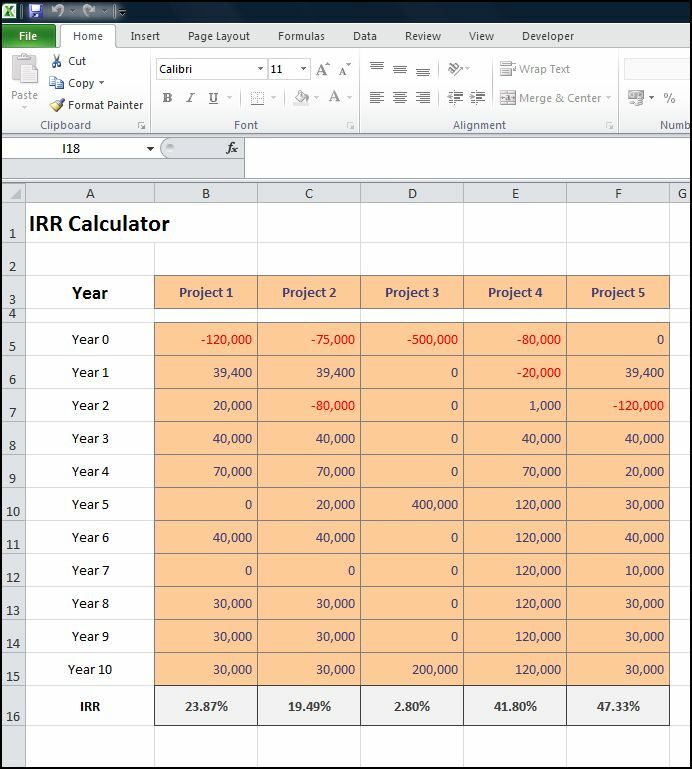 The IRR calculator is available for download in Excel format by following the link below. Users use this IRR calculator template at their own risk. We make no warranty or representation as to its accuracy and we are covered by the terms of our legal disclaimer, which you are deemed to have read. This is an example of an IRR template that you might use. It is purely illustrative of how to calculate an IRR. This is not intended to reflect general standards or targets for any particular company or sector. If you do spot a mistake in the IRR calculator, please let us know and we will try to fix it.